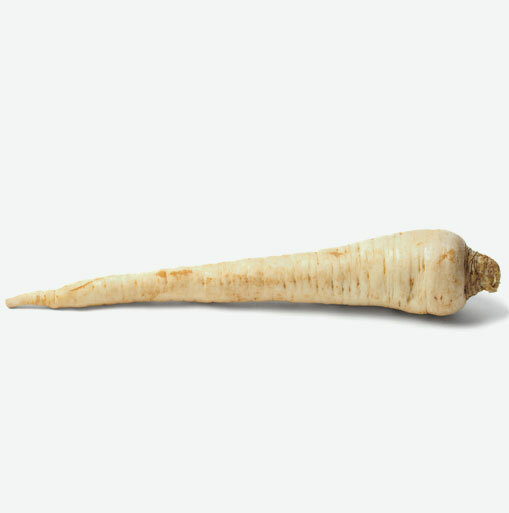 The parsnip is a root vegetable related to the carrot. Parsnips look like carrots, but are paler and have a stronger flavour. Parsnips were once used much like potatoes are today. • Excellent source of potassium. • Great source of dietary fiber. • Good source of vitamin C.
When storing parsnips keep in a plastic bag and place in the vegetable drawer of the refrigerator to keep fresh for up to 4 days. Look for small to medium, well-shaped roots that do not have a lot of hair-like rootlets. Choose parsnips with a creamy-white, smooth, firm surface. Do not wash parsnips before storing. Cooked parsnips can be refrigerated and used within three days. Parsnips have a sweet, nutty flavour. They are best after being exposed to cold temperatures so that their starch content is converted into sugar. Because of their strong flavour, use parsnips sparingly in soups and stews. Before using, rinse well, trimming the root and leaf ends. If the parsnips are small and young, you can clean with a vegetable brush instead of peeling. Larger parsnips may need to be peeled and have their woody cores removed before cooking. Be careful not to overcook parsnips as their flavor is sweetest when just tender. Note: Peeled and trimmed parsnips will turn dark when exposed to the air so cook them immediately or keep them in water with a little bit of lemon juice until ready to cook. If tender, parsnips can be eaten raw. Small pieces of raw parsnip add texture and a tingly taste to mixed green salads. Baking: Put whole or cubed parsnips in a covered baking dish. For savory results, season with broth and herbs and for sweet; cook as you would sweet potatoes, with orange juice, brown sugar, ginger and nutmeg. Cook for 20 to 30 minutes in the oven at 350 F.
Boiling: Bring a saucepan of salted water to a boil. Drop whole or cut-up parsnips into the water and simmer until tender. Cook about 5 to 15 minutes or until tender. Micro waving: Cut parsnips into large chunks the same size and place in a microwave able dish with about 2 tablespoons of water. Cover with a lid or plastic wrap that has a few holes in it for steam to escape. Cook on high until tender, about 4 to 6 minutes. Puréeing: Boil, microwave or steam parsnips until very tender. Save some of the cooking liquid. In a blender or food processor, carefully place the cooked parsnips. Process until smooth. If purée is too thick or lumpy, add a very small amount of the cooking liquid and process again until smooth. Roasting: In a roasting pan or on a lightly oiled baking sheet, place parsnip slices or cubes. Cook for 30-40 minutes in the oven at 425 F, turning once, until softened. If desired, season parsnip before cooking with salt, pepper and spices or brush lightly with olive oil. Steaming: Cook, trimmed, well-scrubbed parsnips in a steam and cook over boiling water. Or, place them in a saucepan with ½-inch boiling, salted water. Cover and cook until tender. Let cool and peel. For whole parsnips cook 20 to 40 minutes, for cut-up pieces 5 to 15 minutes, depending on size and age.